Insure your bets on Man United vs Man City match with Betway’s Goalscorer Money Back Offer! 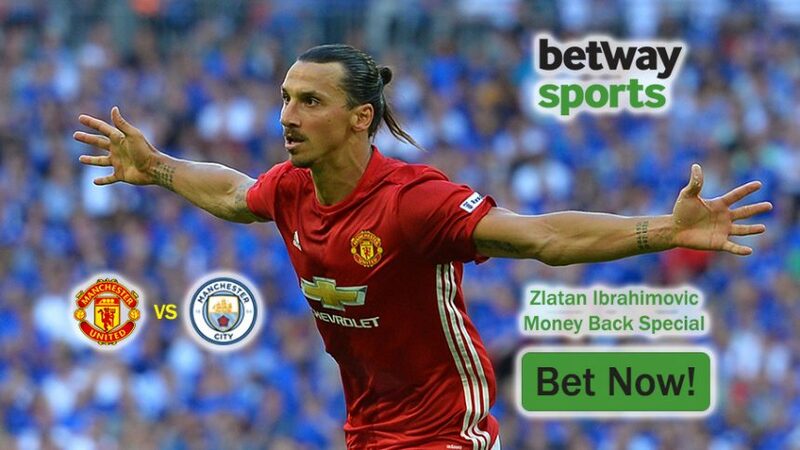 Place a £5 wager (or more) on the Correct Score or Goalscorer market for Man United vs Man City, and if the imposing Swede finds the back of the net during the 90 minutes, you’ll receive a refund up to £25 in Free Bet! You can’t lose money with the Goalscorer Money Back Offer; you’ll either win or get a refund in Free Bets! Make sure you place your bets before the game starts tomorrow at 12:30 BST (September 10)! Man United are the favourites 2.30 (13/10) to win the derby, while their noisy neighbours Man City have been dealt underdog chances 3.25 (9/4). A tie between the two stands at 3.25 (9/4). The two sides have met each other on 171 occasions until this point, with Man United leading the way with 71 victories over Man City’s 49. The rest of the 51 encounters ended in draws. Bet now with Goalscorer Money Back Offer! Ahead of the highly-anticipated game, Ibrahimovic lavished praise on the Man United boss, who previously managed him at Inter for one year before the Swede opted for a move to Barcelona in the summer of 2009. Ibrahimovic has made a perfect start to his career at Old Trafford by scoring three goals in his first three appearances in the Premier League, and also another one in the Community Shield. But now he’s gearing up to face his former manager Pep Guardiola, who’s in charge of the Sky Blues – the man he notoriously fell out with during his single season with Barcelona in 2009/10. Insure your bets on the Manchester derby tomorrow with Goalscorer Money Back Offer and collect up to £25 in Free Bets! Grab up to £25 with Goalscorer Money Back Offer!